Arm pain snake bite tells of a fearful injury to the upper limb. Arm pain snake bite tells of a fearful injury to a man's upper limb; don't mess with these reptiles. This page is not for the fainthearted! 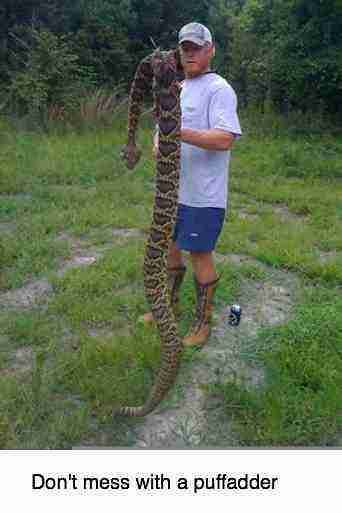 The puff adder is one of Africa's most venomous snakes and whilst I have seen many, never one this large. The combination of the very toxic venom and the damage done by the awesome fangs makes the puff adder a very dangerous reptile. The puffadder is responsible for more deaths than any other snake in Africa. A puffadder attack is a fearful thing. Nevertheless we should try not to kill these creatures; they do much good in the environment too. This young man was attacked by a puffadder and it stripped off the skin from his left forearm revealing the flexor muscles supplied by the median nerve, but miraculously the the median nerve itself and the radial artery were not damaged. One can only salute the incredible skills of the trauma surgeons who attended to him. This damage is from the sheer force of the strike, the long fangs penetrating deeply and stripping off the skin. 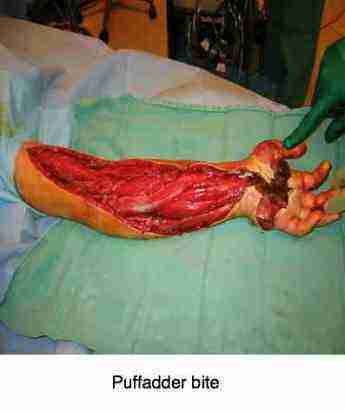 Those are the median nerve supplies the flexor muscles of the forearm and hand. These muscles flex the wrist activate the fingers and some of the muscles of the thumb. The thumb interestingly is so vitally what gives humans the dexterity and ability to undergo so many tasks, that it is supplied by all three of the major nerves that supply the arm. So even if the median nerve had been irreparably damaged by this nasty arm pain snake bite, he would still have had partial use of the thumb. 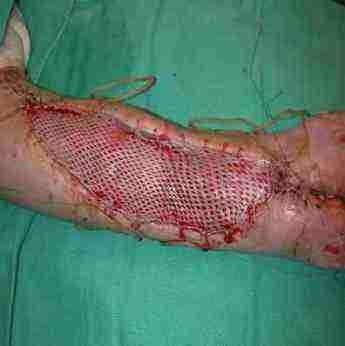 Note the skill of the surgeons who not only saved him from massive infection and injury to the nerves, muscles and blood vessels but with skin grafts managed to restore his arm. The venom is cytotoxic, destroying the cells of muscles, skin and other tissue. There is massive local swelling and tissue necrosis, as well as spread along the lymphatics. Human death usually occurs after about 24 hours if the condition is not carefully managed. Why on a chiropractic help website you may well ask. Well, I just found it interesting, working with these nerves and muscles from the other side of the skin, on a daily basis. And it's good to be reminded of the dedication and skills of other healing professions. Astonishing. Whilst obviously his arm will be always partly disabled, it would have been very interesting getting involved in the rehab of this arm.